If you savor the satisfaction of ripping paper foundation from the back of a brand new paper pieced quilt, then these 7 Free Paper Piecing Patterns for String Quilts are for you! They're the perfect solution for recycling both leftover fabric and scrap paper. Use fabric strips cut from old clothing and linens, and cut paper piecing foundations from old phone books, newspapers, or files of papers you no longer need. By the time you get through all of the string quilt patterns in this collection, you wont' even need a paper shredder anymore. Once you try string quilting and find out how much fun it is, be sure to download our Super String Quilts: 13 Paper Piecing and Scrap Quilt Patterns eBook. You'll find all these free paper piecing patterns plus more foundation piecing patterns and scrap quilt patterns to feed your string quilting frenzy. 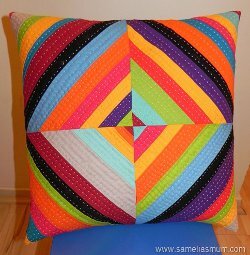 Rainbow All-Sort String Pillow (shown) - This bright and colorful quilted pillow is one of the most cheerful free paper piecing patterns we have! A black stripe sewn across the diagonal of each paper square gives the design a sense of continuity in the finished project, and you don't even have to worry about sewing any zippers on! String Quilting Primer - Learn the absolute basics of making string quilts with this multi-part introduction to this versatile scrap quilt technique. 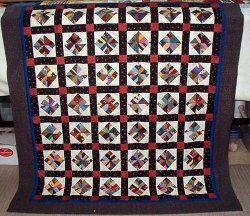 You'll get great tips, like suggestions of what kinds of paper to use for paper piecing patterns and how to maintain a scrap bin specifically for string quilts. Heart Strings Table Runner - This string quilted table runner was designed especially for Valentine's Day, but if you have a different purpose in mind for your table runner, you can always make it with different shades of fabric. Diamond in a Square Strings (shown) - Paper piece half-square triangles for a versatile string quilt that uses a simple diamond in a square pattern. Rainbow String Quilt -Here's another of our free paper piecing patterns made with a whole spectrum of vibrant fabrics! This paper pieced string quilt was made by separating fabric scraps into categories of color and then making each block in a different shade. String X Lap Quilt - This easy lap quilt proves that not all string quilts have to look the same. Just by paper piecing a strip of fabric, cutting a point at each end, and flanking the sides with neutral triangles, you can create the components for string pieced X blocks. Out on a String - Challenge yourself with this free paper piecing pattern for a string-pieced star quilt! After string quilting diamonds, you'll piece them together with partial seams to create elaborate stars. If you enjoyed the paper pieced string quilt patterns in this collection, we know you'll love trying out more string quilting techniques and patterns. Learn more and download your free Super String Quilts: 13 Paper Piecing and Scrap Quilt Patterns eBook today!